A lorry but not much else! The pace of progress has slowed down somewhat over the last few weeks, I can't believe it's a month since I last posted. 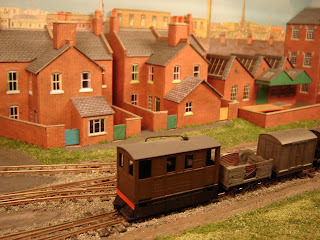 However, earlier in the month I did put together a lorry for the yard. 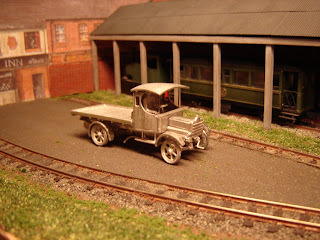 It's a P & D Marsh whitemetal kit for a 1911 Daimler lorry that a friend gave me a little while back. This layout will be set in the 1930's so that makes the truck pretty old, but that then with fewer motor vehicles around they would have been kept going longer, so it should make a good smal-town coal-merchant's truck. It was quite a fiddly kit to put together and it got a bit wonky in the process, but it looks OK and if anyone asks it's had a hard life! The cab roof is not fixed yet, but it's ready for painting. The last picture doesn't show any progress, just Toby shunting trucks. It's nice being able to run trains on the layout, being in the dining room means it's there when I feel like it, or more likely when my son want's to see Daddy's Trains. It also means I can see all those jobs that still need doing!